In the late 19th and early 20th centuries the creations of Jozef Hanula (1864-1944) were also developed and culminated. 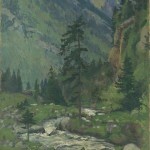 They were based on Munich realistic painting, and also the lessons of symbolism. He mainly developed in the portrait and historical genre, as well as landscape painting, focusing on the ethnographic and folk genre. His mature works express a desire for national freedom, but also the love and closeness of rural people with nature. 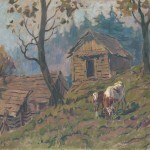 Hanula is regarded as the first openly and stylistically nationally-oriented painter in Slovakia. 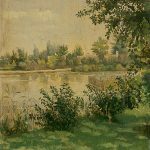 The period of painting history in Slovakia up to the breakthrough year of 1918, when the first independent Czechoslovak Republic was created, concluded with the two expressive landscape painters Ľudovít Čordák (1864 – 1937) and Karol Miloslav Lehotský (1879 – 1929). Čordák applied a mature and generously-rendered realistic concept of forest and rocky landscapes with a touch of romanticism and inclination towards monumentalization. 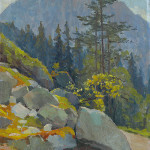 His rendering gradually leads to a more modern rendering of the landscape interplay between composition, subtle color composition and lighting accents. In conclusion his work freed the hand and the form of image composition, emphasizing the expressiveness of color and gesture, as well as light ambiance, intended on luminism. 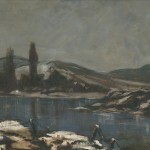 Lehotský represents an individual application of secession art as well as symbolic feelings and moods, particularly applied to the subjects of twilight landscape motifs. 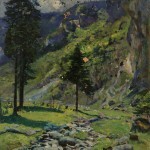 The study of light in landscapes referred him towards pleinairism in his daily motifs. His paintings are a singular example of poetic melancholy expression in the Slovak painting of the 1920s. The last developmental precursor of early Slovak modernism in the first two decades of the 20th century was the group of nationally passionate painters influenced artistically partly by secession and symbolism. The content of the concept was interested in folklore and authentic folk art, also supported by the publishing of the famous almanac Der Blaue Reiter in Munich in 1912, where the publishers (V. Kandinsky and F. Marc) presented forms of folk art from different locations of the world. 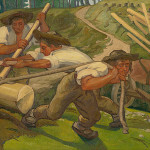 The painters Jaroslav Augusta (1878 – 1970), Gustáv Mallý (1879 – 1952), Peter Július Kern (1881 – 1963) created the first wave of Slovak pre-modern art within this secession-folk expressive and iconic framework. The greater part of their painting work expressively remained on the border between the descriptive representation of rural landscape-figural motifs and their secession form of stylization. In their works, however, we find artistic maturity, the virtuosity of landscape and figural images, as well as a strong incentive for the heroizing and mythologizing of the concept of the Slovak nation. Jaroslav Augusta was mostly inclined towards the folk genre. 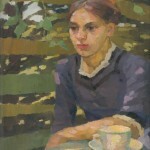 Želmíra Duchajová-Švehlová (1880 – 1955) was a distinct and singular female personality with academic education in Slovak painting, whose painting touched on post-Impressionist foundations and corresponded well with the current period style of Fauvism. She was dedicated to portrait, figure and capricious genre compositions with art motifs. The painter’s climax of this ideological process in the call for nationalism was the work of Martin Benka (1888 – 1972), whose mature works, however, developed after 1918.